The perfect paving job begins with an expertly prepared paving area. That is why we place importance on this preparation. Our staff has the experience to know which sub-base materials work best (dense graded base, crushed stone, etc.) to be used as a base for all different types of surfaces (a roadway, walkway, curb area, etc.) and how to install the material. Once the sub base is installed, the area is compacted, rough graded and compacted again if needed. At this stage the fine grading begins. Sunshine Paving Corporation was the first company in New England to own and operate a CAT Grader 140M with joystick hand controls. It also has a Top Con Automation System. Throughout the grading process, automation is used to determine that the specified grades for the job are being met. 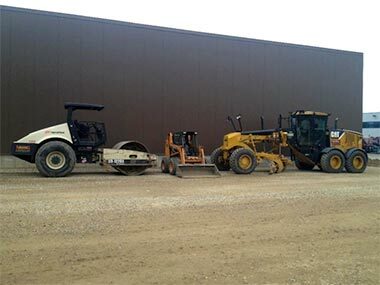 In addition to the automated grader, our rollers are sufficient to provide the necessary compaction. The Grading Supervisor works closely with our Paving Supervisor and will consult with each other should any issues come up in preparing the site. The goal is to prepare the best possible site to make the finished product perfect.